This entry was posted in News/Opinion/Discussion and tagged anarchism, anarchist communism, Anarchist Federation, Angry not Apathetic, GE2015, glasgow, Glasgow Anarchists, scotland. Bookmark the permalink. Decent article mate, I share the desire to keep talking about the dangers of nationalist politics. But your analysis is bit simplistic no? The SNP are clearly coming from a completely different political tradition from the tories, and nationalism is clearly a more complicated ideology than simply a tool to obfuscsate class war. In fact, its only right wingers I’ve heard make what I had though a quite naive argument that the SNP want independence above all else, and would even avoid the chance to implement social reform to do so – that’s almost paranoid cynicism man. As an anarchist our job is to build the revolutionary society everyday right, and that involves, in part, constantly accosting those in power to work in the interests of the working class no? At least while they have power.. There is no value to comparing the SNP and the Tories in that regard, totally different kettle of fish in terms of local MPs, party activists, leadership, policy, campaigns etc. etc. Edinburgh SNP councillors are a different bunch of people to the 56 mp’s, who although they include tartan Tories like Pete Wishart, also include old school labour trade unionists like Tommy Shephard. So yeah, I’m not saying your wrong at all really, just painting only a small part of the picture? Hey there, I agree with you that the SNP and Tories are not the same in the sense that every political party does tend to be different from one another. 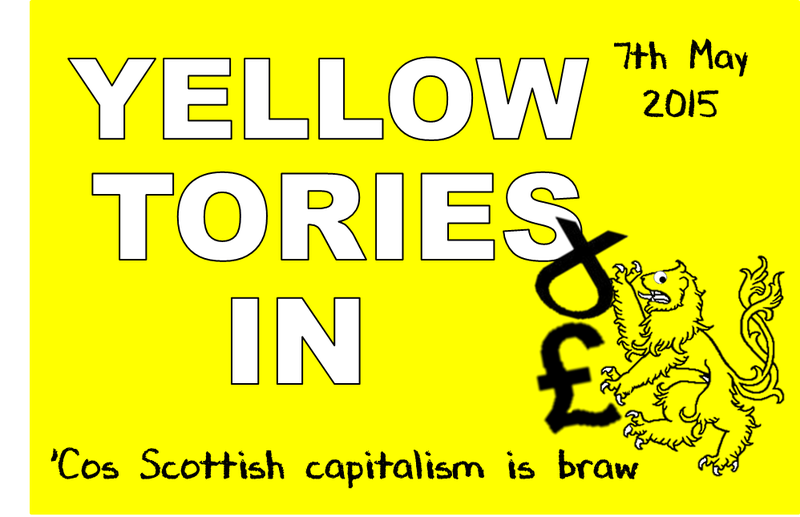 The main reason the SNP are getting called Yellow Tories here is to do with a couple of things, one being that SNP supporters have been calling Labour Red Tories which we see as ironic and hypocritical, as their very own party is happy to implement austerity and, as with any political party serious about getting into government, is going to defend and maintain capitalism and the State. They’re Tories just as much as Labour are. And yes, the SNP are all about independence in the same sense the Greens are about the enviroment, UKIP is about immigration/xenophobia and such. These are the main selling points of each party. The other policies they have are less concrete and very much depend on the political situation and the tactical views of the heads of the party at the time. Nationalism is very much a great tool to obscate the class relations in society and that appears to be it’s main role. Sure what you just said about Pete Wishart and Tommy Shepard, two people opposedly completely against each other when it comes to class struggle, are in the same party. That’s nationalism in action, distracting people from the real conflicting interests in society. Building cross-class alliances to defend the capitalism and the State. That’s why we see the SNP as such a problem, they aren’t Labour or the Conservatives, they’re better at building these cross-class alliances. They’re getting people to enthusiastically fight for something in support of capitalism (the creation of a new nation-state) while also completely moving the political discourse away from class relations, when was the last time Labour or the Conservatives motivated anyone like that en masse? Again I agree with you that it’s up to us to be building the new society in every which way we can, from building support networks and making sure we’re all fed, housed, looked after etc to struggling where we can with who we can against hierarchial forces in society to improve our conditions. When it comes to those in power, it’s not a matter of keeping them in check more of keeping aware that they are never our friends and that they seek to recuperate our autonomous movements into a crutch to support capitalism. And that any victory we win isn’t a gift from them to us but us triumphing at that moment.